THE LONGEST WALLACE ~ Swimming the Doe River in Flood. by Michael Potter | DBP MAGAZINE ONLINE The World's Best Free Whitewater Publication. The rains came to visit East Tennessee on Friday, March 17th. I was happy to see the water levels rising, knowing that I would be home on Saturday and have something good to kayak. When I got the weather forecast I started watching the gauges of my favorite rivers. 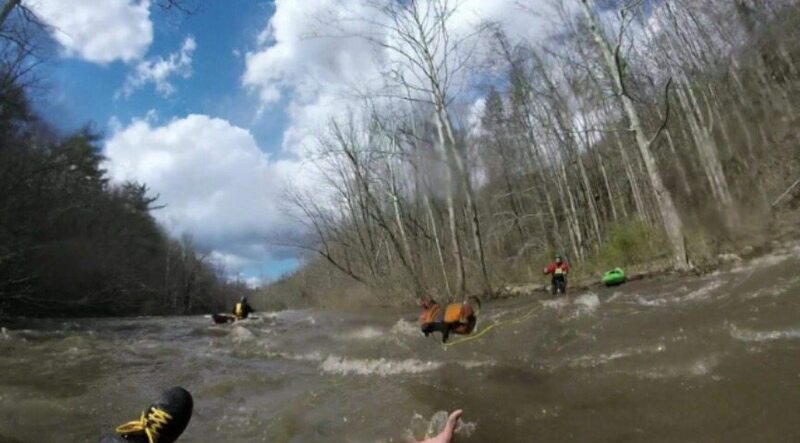 The main one that I was interested in was the Nolichucky, my favorite run. It is a short drive from home and the water levels have not been good lately. In fact, most southeastern rivers have been drier than plug chewing tobacco. I had been driving all night from Indianapolis, heading for home in Greeneville, TN. Around 5 am I messaged Jeff Vannoy. 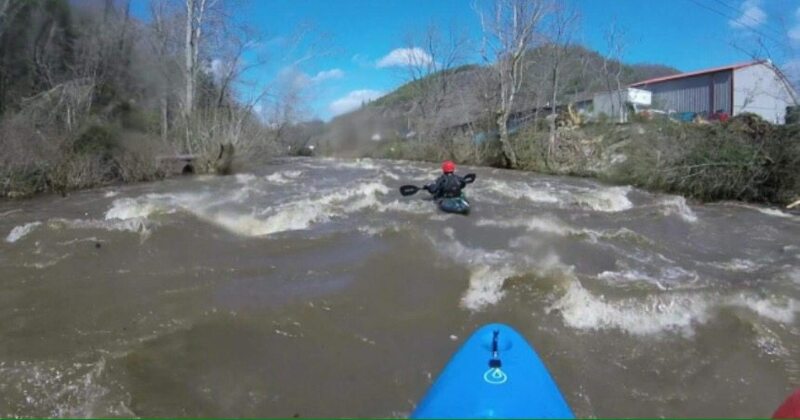 The Nolichucky was at 1700 cfs. That’s bigger than I’ve ever ran the Noli before, my highest being around 1000 cfs. 1700 cfs would be a great level for a step up run. Within minutes Jeff answered me back. 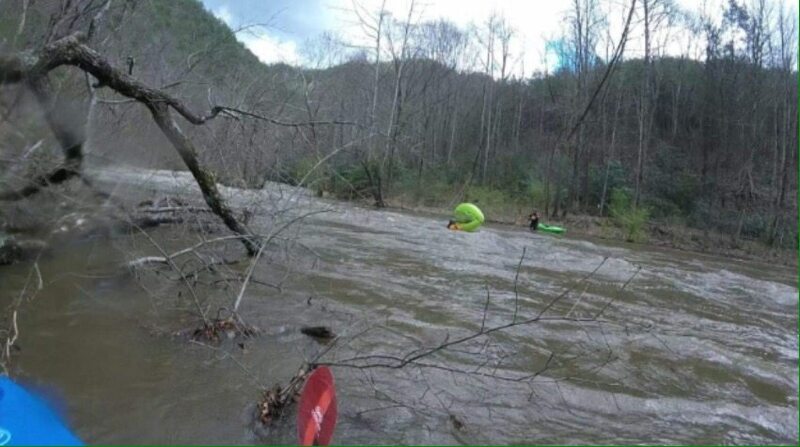 He said, “Hold on, its still climbing.” An hour later he sent an update: 2800 cfs. He started questioning whether I should be on it at that point, and frankly I was questioning the same thing. We both came to agreement and I backed down in total disappointment, deciding to look at other options as we watched the Noli climb to flood stage,12000 cfs. Jeff was undecided at this point about how to plan his day. I told him not to worry about me, I would find something. I knew he wanted to get a big water fix on, a fix that I don’t have the skill for yet. As I kept driving south I decided to call Jerry Griffin just to talk for a few minutes. Jerry mentioned that he was thinking about running the Doe River. I told him that had crossed my mind also. He asked what time I could make it to the takeout. We finally came up with a meeting time of 1pm. 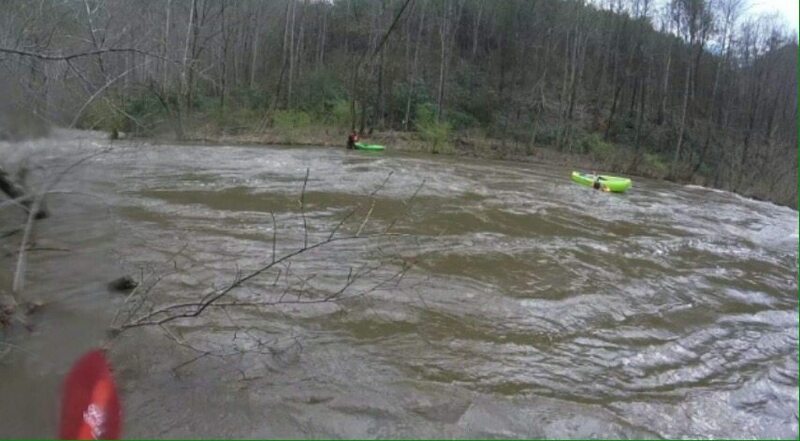 Jerry said that he would post it in the Appalachian Paddling Enthusiasts to get a crew on short notice. I informed Jeff about the run that Jerry and I had decided on. Jeff was still in limbo. Shaun Mullins was checking some gauges on another creek which he was interested in. He told me that the Doe was the perfect choice for me, as I had ran it with Jerry before without incident, and he would let me know if he was coming to join us. Jeff called again while I was in transit to the river, still not sure about his own decision yet. After we talked for a moment he told me Shaun was on the other line and he’d call me back. Five minutes later Jeff told me he was on his way to meet Jerry at the takeout. I was running late so I headed straight to the put in. We now had a game plan in place, and I was happy to be spending the day on the river with these guys. I arrived at the put in and had my drysuit on before they showed up with the rest of the crew. 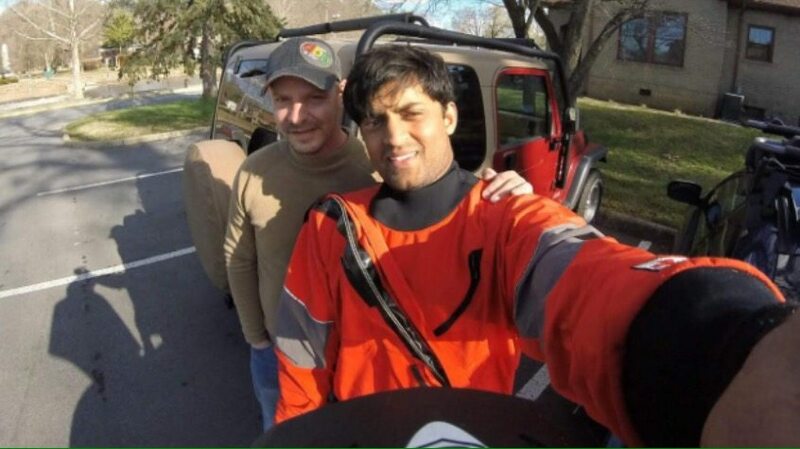 Upon their arrival I met two paddlers I had never paddled with, Brad Eldridge and Rahul Subramanian, along with Jeff, Jerry, and Steve Davis. I was very happy to see this crew of experienced paddlers. We all went down to the river with boats in hand, and when it came into view I immediately knew that it was bigger than the last time I paddled it, a lot bigger. This didn’t bother me, I’d been running a few bigger step up runs and felt ready to make this run successfully. When I first paddled out I felt the push of the current under my boat. This water was clipping along pretty fast. I kayaked across the river and noticed that the eddies were smaller than last year, as in basically nonexistent. I eddied out and waited for the last of the paddlers to get into the water. Finally we were off on what all expected to be a great adventure. The first half mile was just floating what we call boogie water, fast moving current and wave trains. All six of us were mostly floating, paddles in the air or in our laps, with no concern at all. Every now and then we’d dip a blade in, but mostly we were just limbering up. This was Rahul’s pfd; the rest of us had run the Doe before. Jeff was leading, and yelled back to Rahul, informing him of the first ledge that is coming up. I slid to river right and grabbed an eddy to watch the others. Last year this ledge seemed like a 2 ft bump in the river, this year it was a 5 ft drop. “No big deal, just hit the tongue and push on through.” As everyone ran the tongue, I peeled out behind Rahul to be the last person over the ledge. Steve was already upside down and coming out of his C1 when Rahul found the tongue and dropped the ledge perfectly, miraculously finding an eddie to sit in. I made my own approach and realized that while watching Steve, I myself had taken the wrong angle for the drop. I paddled into the swiftest part of the drop at a left angle, which crossed the slight right direction of the current. The nose of my boat found the small hole at the bottom of the drop. I could feel the rear of my boat going faster downstream, which threw me off balance. My Flying Squirrel flipped over so fast that I still had my mouth open sucking air as I went under. Instead of getting air, I filled my lungs with rich chocolatey, muddy, nasty tasting water. Immediately I went into my tuck position and choked the water out of my lungs. My tuck felt weak, like I was not getting close enough to my boat. 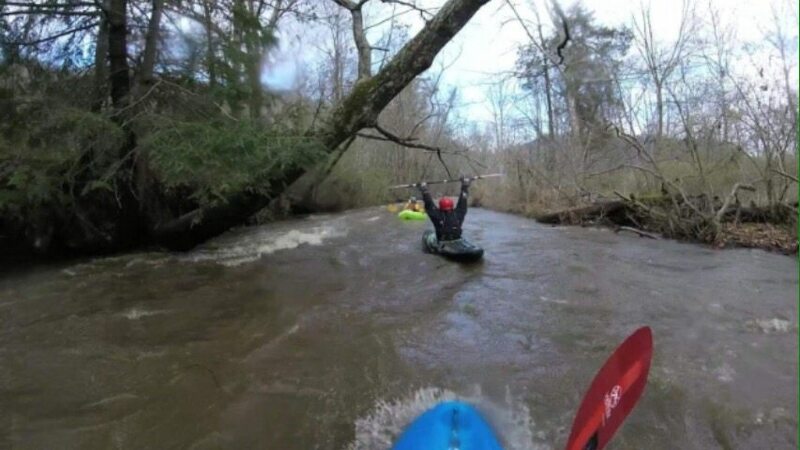 I threw my paddle up while still choking and tried my roll unsuccessfully. I didn’t even give it a second chance before instinct kicked in and I pulled the skirt. First drop and I’m swimming! Not realizing how fast the current really was, I tried holding onto my boat thinking I could self rescue. Now I’ve never been the brightest crayon in the box, but I realized pretty quickly that this thought is pure brainchild! After just a few seconds I was getting Wallaced by rocks on my legs, dragged through low lying brush, and sucking more water down my lungs. I turned the boat loose and started self preservation swimming mode. I couldn’t seem to break the current. The river kept pulling me faster and faster against rock after rock. I took a quick glance to my right and saw Rahul in the eddy, then another wave splashed me and blocked my vision. Coming out of the wave, I saw Rahul get caught by the eddyline and get flipped into the current. Three of the six person crew were now in the water. Downstream I saw Jeff giving his best attempt to bulldoze my boat to safety. It’s a long way down stream before I could get to shore, even though I was using my paddle for swim blades. Not knowing what happened to my boat, I finally got to an eddy where I found Steve trying to recover on the shoreline. We saw Brad on the other side of the river with Steve’s C1 on the banks. Jeff and Jerry were now way downstream from us and out of sight, and I wasn’t sure where Rahul was at that moment. A few minutes passed before Steve and I started walking the river bank toward our boats, Steve already knowing that he was going to have to take another swim to get to his boat. We’d gone only a few short yards when we ran into a thicket that was virtually impassable. Steve decided to start his swim here. I looked around at the best possible options of escape. There were no good options: a steep, loose, rocky uphill climb, the thorn thicket, or swim. I chose the later and crawled cautiously back into the water, and stayed as close to the bank as I could. The current was still swift here and carried me faster than I wanted to go, bouncing feet first off the shallow rocks near shore. Up the hill I went. Upon reaching the four lane, I headed for my car, looking over the embankment at the distance traveled. It had seemed like a quick swim. It wasn’t huge waves, but rather fast, semi-shallow water. I had been walking almost half a mile before I reached the ledge that started this carnage. I was standing there staring at that ledge (looking like an idiot in helmet, drysuit, and booties, with paddle in hand) when the local sheriff pulled up beside me. He asked me if I was ok and explained that he had gotten a call about a boat floating upside down below the twin bridges. I showed him a cut on my hand and explained that my pride and ego were the only casualties of the day. He gave me a ride to my vehicle. I sat in the back seat of a patrol car for my first time, with my paddle stuck out the side window. Man, is that a creepy feeling! I thanked him for the ride and quickly jumped in my car to chase my boat. I made my way hurriedly to the twin bridges and started scouting every place that I came to for my kayak. With no success I was forced to go to the dam and hope that my boat would float by. I had sat at the dam for an hour or so and had given up hope. I turned and headed for my car. I hadn’t gone twenty feet before a white chevy suburban pulled up beside me. I looked up as the passenger rolled the window down. The vehicle was a full regalia Carter County Rescue Squad. The gentleman in the passenger seat asked me if I had lost a kayak lately (while grinning from ear to ear). I just dropped my shaking head in defeat and described my Squirrel to him. He told me to follow him over to the facility to pick it up. The rescue squad had received an emergency call about a boat caught in a strainer and weren’t sure if the paddler was in it. They had made contact with the sheriff and he told them to go to the dam after recovery and look for the moron in the clown suit. Well, they had no problem finding me. I filled out some papers at the squad department and got my boat back. 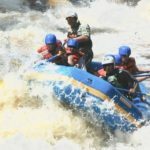 It had been thrashed going through two strainers and multiple rapids. All of the outfitting had been knocked loose, the seat was pushed forward and completely off track, and there were multiple scratches and dents. It was still in good runnable condition though, everything just needed to be re-tightened. I drove back to the dam to meet the rest of my crew. While I was waiting, I realized that my right foot was throbbing. I took my bootie off and realized something else. 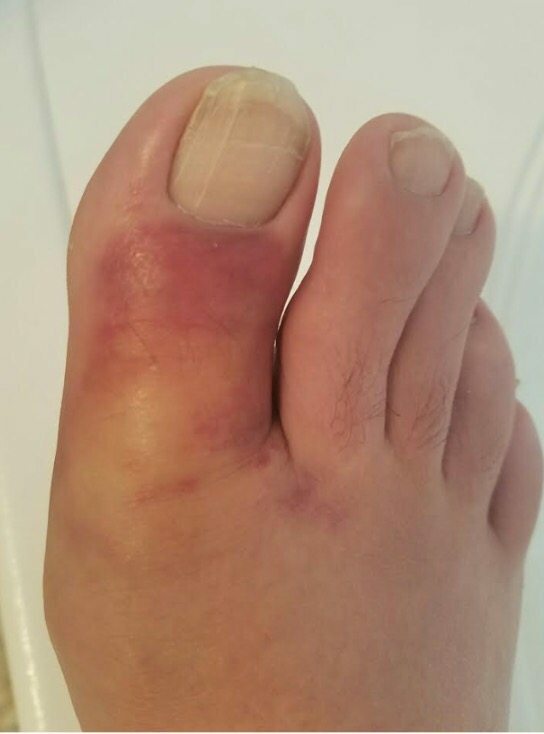 I had broken my big toe! After thirty minutes one of the crew showed up in an unfamiliar truck with no paddle. Soon the others showed up as well, in their boats! Jeff recapped the day as he and I ate dinner afterwards. The final tally: Eight swims, four rope throws, one hike out, one lost boat, two paddlers caught in strainers, two lost paddles, one lost throw rope, one call to the rescue squad, one ride in a patrol car, and one broken toe- WALLACE. Jeff said he had never seen so much carnage on a river before. At one point he had two ropes in the water, a rope in each hand! This day was epic! The next weekend I returned to the class ll Nantahala River to rework my skills and tighten up the weak spots in my game. I have quite a bit of work to do before I go back to a step up run. My swim on Triple Drop of Big South Fork was more intense but not nearly as long as my Wallace on the Doe. Hopefully I will gain the skills to stay in my boat soon.